Launchpad couldn't import bug #10396 from Linux Kernel Bug Tracker. We tried installing gutsy i386 server (both beta and 2007-10-04) on a Dell PowerEdge 2650. The install went fine up until it failed to come up on first boot post-install, with the AACRAID driver complaining loudly about aborts and resets. I booted into recovery mode and installed the -generic flavour onto the installed system. When I choose that in grub, the installed system boots up fine. I'll attach a couple of screenshots of the kernel in it's broken state. Similar problem here on two different models of Compaq Proliant. I don't have a clue what's going on, so this is as good a place to post the issue as any. At first, the server and 386 kernels boot but no video. SSH works, but no hardware video. The keyboard worked, as I could log in and reboot by typing from memory without screen feedback. Figuring the problem was something about the video and my LCD screen, I used vidmode=-1 to force simple vga. On reboot, kernel starts to boot, then hangs and the keyboard LEDs start flashing. The upgrade to gutsy seems to have hosed up the kernel configurations. For one, the first stanza in the grub menu is to the 386 kernel instead of either the server or generic (686) kernel. Second, the video hasn't been working correctly. I have the suspicion that the apparmor dependency on the 386 kernel and the linux-image-ubuntu-modules are the culprits, but I have no idea. Kernel-level issues are rather foreign to me. I have only a dim inkling of what's going on in that magical moment between when grub fires off and the machine starts booting. I had the same exact problem with my PE2650 after an upgrade installation. From your screen shots, I noticed that you were running the same firmware level I had - Adaptec PERC 3/Di v 2.8.0.6089. Checking Dell's support site, I found 3 newer firmware versions. I installed the latest (2.8.1.6098) , and now my system boots just fine to the 2.6.22 kernel. This is happening on PE2950 and PE1850's as well!! What is the status of this bug? We are having major issues with it. None of our servers that are on Gutsy will boot without backing up to the old Feisty kernel!!! Same problem here. Upgraded firmware from 2.8-0 6089 to 2.8-1 6098, rebooted and booting fine. Installation was successful, first boot came up with no problems. What version of firmware are you using on your 1850s? I am assigning this bug to the 'ubuntu-kernel-team' per their bug policy. For future reference you can learn more about their bug policy at https://wiki.ubuntu.com/KernelTeamBugPolicies . Turns out my problem was that I had vga=791 on the kernel line and the new kernel doesn't like that at all. I think this is probably the bug in my case at least. Same problem affecting Hardy beta of 2008-04-02 i386 on Dell PowerEdge 6300/550 with an Adaptec PERC/2 controller. This also affects Gutsy and was reported during the Gutsy development cycle in a separate bug report. Cannot boot from server CD because of various aacraid failures. Using irqpoll or noapic doesn't help. I'm trying to capture photographs of the kernel boot messages but they are a bit zippy! Jul 6 08:12:57 kernel: [ 5.385325] libata version 2.20 loaded. There seems to be a problem with the cdimage server containing the Feisty Server CD image (long time outs, less than 1KB/s transfer rate) so I've installed Feisty Alternate x86 command-line on the Dell PowerEdge 6300/550 in order to get some information on the hardware. Note that after the installer reboots the system the PERC/2 controller reports unflushed data in the cache and refuses to boot the kernel. It requires a power-off followed by a full system memory count (which can take over 5 minutes) to clear the situation. I attached a serial console and captured 2.6.24-15-generic attempting to start. I've attached the log-file so we don't need to rely on screen photographs. [ 499.829084] uhci_hcd 0000:00:02.2: host controller process error, something bad happened! [ 499.837347] uhci_hcd 0000:00:02.2: host controller halted, very bad! 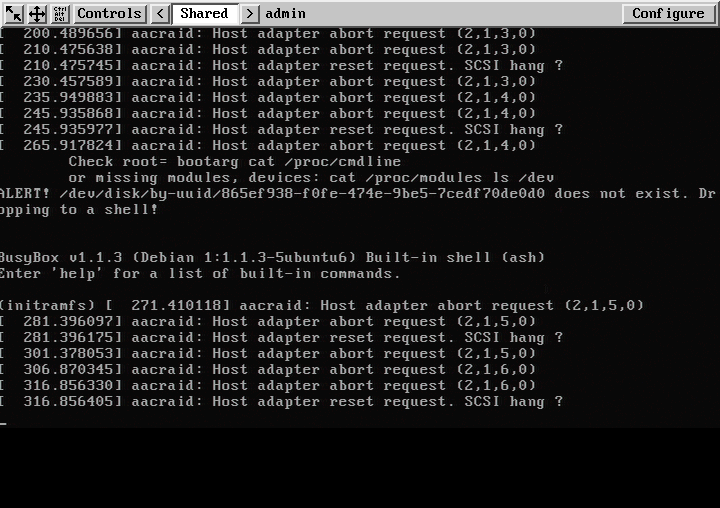 [ 708.005536] aacraid: aac_fib_send: first asynchronous command timed out. For comparison here is a successful boot log from the serial console with Feisty 2.6.20-15-generic. Update your RAID firmware. Looks like you're on the same level that others were when experiencing this problem. -Background controller cache flush routine modified to flush smaller number of buffers during I/O without impacting RAID throughput. This change fixes driver timeout (manifesting as loss of drive access and filesystem errors like ext3_get_inode_loc errors) seen under certain Linux configurations. You're on the version just prior to this. Note that there are several versions even newer at this point. Firmware was updated to the latest available from Dell going by the service tag last year. I checked for more recent releases this week before chasing the bug. The update dates are the same as the ones here *but* checking the build number I see 2.8.0 6099 is claimed for the floppy-disk installer. I'll grab all the updates again and apply them and see how things go. With the latest (2008-04-04) PERC 2 firmware 2.8.0 6099 the issue remains. It looks as if the root cause of the Dell PERC 2 issue is ACPI config-interrupts. I've been able to boot v2.6.25-rc8 with the kernel option "pci=noacpi". a git-rev-list shows 277 commits to ACPI between v2.6.20 and v2.6.22 so it's going to be a big job to narrow it down. I've discovered the cause of the issue. The system contains an i450NX chipset which has peer PCI buses. To work around buggy BIOS situations where these weren't discovered a fix-up was added that looks for and scans them as secondaries of the first root bus. This causes the later ACPI code to ignore them because they are already in the pci_root_bus list. The patch applies some DMI matching that looks for the Dell PowerEdge 6300 and if found, doesn't apply the i450NX fix-up. The system is now undergoing testing to discover any side affects of preventing the buses being discovered as secondaries. Patch posted to kernel-team mailing list. Hopefully will be incorporated before Hardy release. Bah. A fix for this really should be in the Hardy kernel. TJ Whatever your bug is, it's not the one referred to in this bug. on a Dell PE2650 after the install. (The boot from CD and install work fine). but the *-generic* kernels never do. You reported a kernel panic on a Dell 6300 with a -generic kernel during an install. Is anyone actually dealing with the original bug -- which still exists in Hardy or does the Perc firmware update always fix it? If it does, we should get this onto the front page. I'm going to go do a firmware upgrade now that I've seen this with Hardy also. On my Dell 2650 with a Perc3\DI running Gutsy, I upgraded the firmware for the PERC yesterday, and that is now allowing me to boot the -server kernels, where before I would get the aacraid errors reported by others. Confirmed. I just did the same thing. edited adalnx.sh to change the shell to bash and ran it. Then i ran ./adalnx and it flashed the controller BIOS. Now if I could just do something similar with the Remote Access card. Since you're the original bug reporter, care to comment if the firmware updates mentioned here resolved this for you? TJ - I'll follow up with your bug at the new report you opened. Upgrading the SCSI card firmware of the boxes in question did "fix"
that may well never happen. dose this bug coursed by pe 2650 firmware or ubuntu? if it about firmware,how to upgrade it. if it about ubuntu,and how to deal with. Report being fixed with Dell firmware update v2.8.1.7692 (build 7692). Tested OK with Hardy 9.04 and Karmic 9.10 on Dell PowerEdge 2550 with PERC 3/Di (hw pci id 1028:0002). Problem is in firmware: "PERC has no 64 bit scsi passthrough function." PowerEdge 2550 PERC Firmware v2.8.1.7692 is available on Win32 floppy writer program only. I extracted files from floppies http://esa.hakkinen.com/konehuone/dell2550/ and used FreeDOS to flash firmare. Patch first motherboard BIOS and reboot, then PERC firmware, otherwise bricking will happen. It's good idea to have v2.8.x firmare already patched before this update. readme.txt says v2.6 is minimum, other sources recommend updating from v2.6/v2.7 to 2.8.0 first. Seek ftp://ftp.us.dell.com/sysman/ and dell support site for firmware updates.